Dypsis lutescens, (formerly Chrysalidocarpus lutescens), Butterfly Palm, also known as Areca Palm and Bamboo Palm is a beautiful and graceful clumping palm that originated in Madagascar. With a moderate growth rate it can reach 20 feet and is widely used in hot climates. Because of its clumping characteristic it can easily be used as a screen, but it looks best when all but the tallest trunks are thinned out. The trunks are slender with feather shaped fronds as long as 8 feet. It has moderate salt tolerance and high drought tolerance. 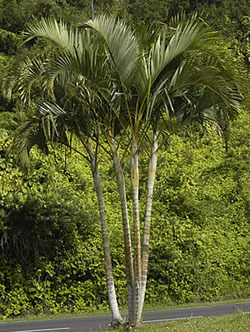 This palm is often sold as a house plant, but it needs adequete light in order to thrive.